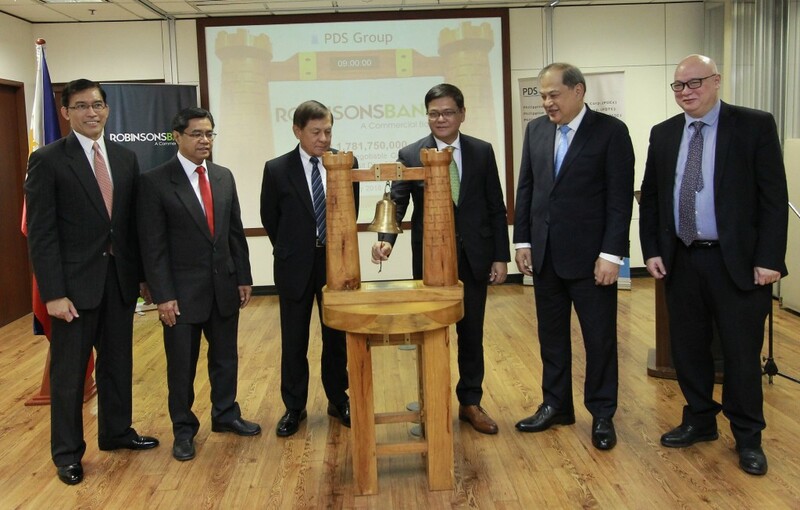 16 July 2018, Makati Philippines – Robinsons Bank Corporation (RBANK) celebrated its second listing in the Philippine Dealing & Exchange Corp. (PDEx) organized secondary market with its PhP 1.78 Long-Term Negotiable Certificates of Time Deposit (LTNCTD) Due 2024. Robinsons Bank’s total LTNCTDs listed in PDEx now stands at PhP 5.96 Billion while the JG Group of Companies’ combined level of listed outstanding securities increases to PhP 47.96 Billion, representing 5% of the total corporate fixed-income issues in this registered market. PDS Group President Cesar B. Crisol was pleased to report that the year-to-date total of new listings in PDEx has eclipsed the PhP 100 Billion mark, bringing the total corporate fixed-income issues in PDEx to PhP 893.01 Billion, issued by 47 companies comprised of 145 securities. “This is remarkable given the difficult market environment and especially that of the interest rate markets through most of this year. We must congratulate the underwriters for guiding Issuers and investors through these rough seas and maintaining the energy and vibrancy in the primary market for corporate debts. May you continue to steer the entry and appetite of both our issuers and investors and see the community of believers widening and deepening,” said Mr. Crisol.